Transformers: Revenge of the Fallen came out this weekend, and in almost every conceivable way it is the polar opposite of 2008’s Frost/Nixon. The former is, from what I have read, a typical Michael Bay exercise in excess: explosions, lightning-paced editing, the hottest young stars, blazing weaponry, insane chases, and more explosions. The latter has none of these, and its leads are virtual unknowns–especially compared to the headlining actors in Transformers: RotF. But it is this limited canvas with which director Ron Howard paints a very interesting, engaging, and (dare I say it? Yes, I dare!) entertaining movie about…well, about little more than a series of TV interviews between a talk show host and the former president. Movies based on plays are a tricky proposition for today’s audiences weaned on the theatrical bombast of directors such as Michael Bay, Tony Scott, and the Wachowski Brothers. Not to mention their forebears, the great Lucas and Spielberg. Whereas movies often employ special effects, realistic audio, blaring soundtracks, and a host of other tricks to enhance the viewing experience, plays instead offer, for the most part, only dialog cemented by good ol’fashioned acting. And this is why adapting a play into a movie is a somewhat daunting task for any director, but Ron Howard manages to pull it off quite nicely. In many ways, Frost/Nixon is the spiritual successor to Rob Reiner’s A Few Good Men. Both are based on plays. Both are about well-nigh untouchable political figures brought down by unlikely young spitfires. Both feature extended dialog-heavy sequences with no changes in setting. Music and special effects are used sparingly, characters are well-defined and interesting, and yes, both movies feature none other than the estimable Kevin Bacon. But whereas Reiner’s 1992 movie was a largely fictionalized account of military justice loosely based on the experiences of young military lawyer Donald Marcari, Ron Howard’s film is about the verbal toppling of none other than Richard Nixon himself. 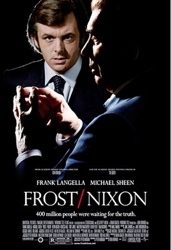 Frost/Nixon follows the tale of David Frost, a talk-show host who hatches a plan to get Richard Nixon to admit to wrongdoing while in office and apologize, on camera, to the American people. His preparation and interview methods are better suited to the theatrics of a boisterous TV personality, and I enjoyed seeing him come face to face with the political powerhouse that is Mr. Nixon. What kept me entertained through the dialog-heavy film was the constant sense of awe and wonder with which Mr. Nixon is portrayed–not awe for his politics, but a healthy respect for the type of man he was: an extremely savvy politician who was not to be trifled with. Michael Sheen’s portrayal of the young, eager David Frost who is forced to come to grips with his own shortcomings and find a way to, as in A Few Good Men, get an extremely powerful man to admit to his own wrongdoings, even though it will cost him dearly, is impeccable. The two men eventually come to a mutual respect for each other, and it is this character journey that makes Frost/Nixon as entertaining as anything Michael Bay could ever do. Undoubtedly, one of the best movies of 2008.